The distributors of Entertainment should require prospective international audience members to take a placement exam before entering the theater. Do you speak Hindi fluently? Have you seen every Bollywood movie of note since 1960? No? Then don’t bother buying a ticket, because you won’t understand most of the jokes. It’s so frustrating because Entertainment‘s plot is straightforward and high concept. Akhil (Akshay Kumar) discovers that he’s the illegitimate son of a recently deceased millionaire, Pannalal Johri (Dalip Tahil). Thinking he had no heirs, Johri left his estate to his dog, Entertainment (Junior, a cute Golden Retriever). Akhil tries to get rid of the dog and claim the inheritance but learns that he’s not the only one after the money. With Entertainment, directing duo Sajid-Farhad had the chance to make the kind of accessible, family friendly film that remains rare in Bollywood. Unfortunately, many potential audience members will feel left out while watching the movie. As with many Bollywood comedies, there are loads of wordplay jokes that by their very nature don’t translate well from Hindi to English. Furthering the problem is that Akhil’s best friend, Jugnu (Krishna Abhishek), speaks exclusively in movie references. Only some of his references to the plots of classic movies are explained. Worse, he cites dozens of popular actors, using the literal meanings of their names as the punchline. (The English equivalent would be names like Grace, Daisy, or John.) The production team’s stalwart translators display only the literal meanings for the English subtitles on screen. Though one can hear Jugnu say “Sonakshi Sinha” as part of a punchline, her name doesn’t appear on screen, only the direct translation. It botches the joke and clearly delineates non-Hindi speakers as outsiders. Of course, the bulk of the audience for Entertainment resides in India, watches Bollywood movies, and speaks Hindi, but the easy-to-follow story and English title made this an obvious crossover movie. The final product squanders that opportunity. Entertainment is much more successful when it demonstrates an understanding of movie conventions and uses them for humor than when it just has characters list the names of films and film stars. Some of Entertainment‘s funniest moments are when the movie breaks the fourth wall, usually at the hands of Akhil’s girlfriend, Saaskshi (Tamannaah Bhatia). Saakshi is a TV soap opera actress who has trouble leaving her work at the office. She breaks into soliloquies in which she addresses the camera directly, and the results are always funny. One more great bit of metafiction involves the other claimants to Johri’s fortune, stepbrothers Karan (Prakash Raj) and Arjun (Sonu Sood). Whenever Karan raises his hand to strike Arjun, Arjun cries and invokes their dead mother. This triggers a mournful old movie tune sung by a woman, which causes the brothers to cry and make up. This song isn’t just in their heads. It’s audible to everyone, causing Saakshi and Akhil to look around confusedly for the source of the spectral singing. Though Kumar’s comic performances are hit-or-miss, he’s pretty good in Entertainment, because the slapstick isn’t overdone. The supporting performances are good, too, especially Bhatia, but also Johnny Lever as Johri’s estate manager, Habibullah. (There are a bunch of jokes involving people messing up Habibullah’s name, and I didn’t understand what was so funny about them, either). If you speak Hindi and have a depth of knowledge of Bollywood movies, you’ll probably enjoy Entertainment. It has some good gags, there are tons of cute dogs, and the story moves quickly enough. If you don’t understand Hindi or aren’t a Bollywood historian, I’d skip it. 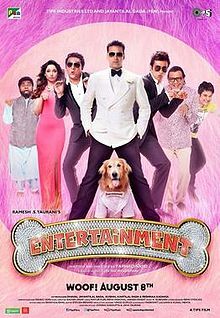 This entry was posted in Reviews and tagged 2 Stars, 2014, Akshay Kumar, Bollywood, Dalip Tahil, Entertainment, Hindi, Indian, It's Entertainment, Johnny Lever, Junior, Krishna Abhishek, Movie Review, Prakash Raj, Sajid-Farhad, Sonu Sood, Tamannaah Bhatia on August 8, 2014 by Kathy. Kathy that spectral song was from a movie “Karan Arjun” a hit movie from 90s.